Catherine Edgerton’s exhibit--which explores mental health in an insane society--maps the journeys of seven multi-media, stained-glass kaleidoscopes. Their paths are interwoven with work from Catherine’s hand-bound collage books, which explore her own navigation of mental health and related points of departure. It also includes interactive crisis prevention/ intervention work created with the Art Asylum, turning the critical lens to the system we live in, while building creative cosmic connections between and beyond us all. Saturday 4|15, 3-5pm.........Advance Directive Workshop #1 (Legal Session ): Mavis Gragg, a (magical) local estate planning attorney, will offer a workshop on estate planning basics with special attention to mental health advance directives and special considerations for artists. Mavis will be joined by Joy Long-Vidal, LPC, a (magical) mental health clinician with a background in community mental health and public health. In this workshop, we will look closely at the state of NC mental health advance directive form, and learn instructions for completion of the document, as well as how to file it with the state. $1-$20 sliding scale. Sunday 4|16, 3-5:30pm....Advance Directive Workshop #2 (Creative Session): The Art Asylum offers a magical experience of working through a template for Creative Advance Directive Booklets. Interwoven with poetry, art, and reflections from the Durham Artists Movement, this book is a guide to empower creativity, community, and self-determination in making creative blue-prints and instructions for the care of oneself in the event that one has become unable to make decisions. Altho this template was created specifically as a tool for folks who struggle with mental health, it can be used as any form of advance directive. $5-$30 sliding scale includes book. Scholarships available. Catherine Edgerton builds multi-media stained-glass kaleidoscopes, and gifts them to people who struggle with mental health an addiction, with the intention that they be re-given. This exhibit displays seven of the kaleidoscopes, and maps their imaginary journeys through blind contour drawings of recipients. The journeys are interwoven with prints of pages from hand-bound multi-media collage journals. The books, which are also on display, document Catherine’s own navigation of mental health, whiteness, creativity, resistance, and addiction in the south. 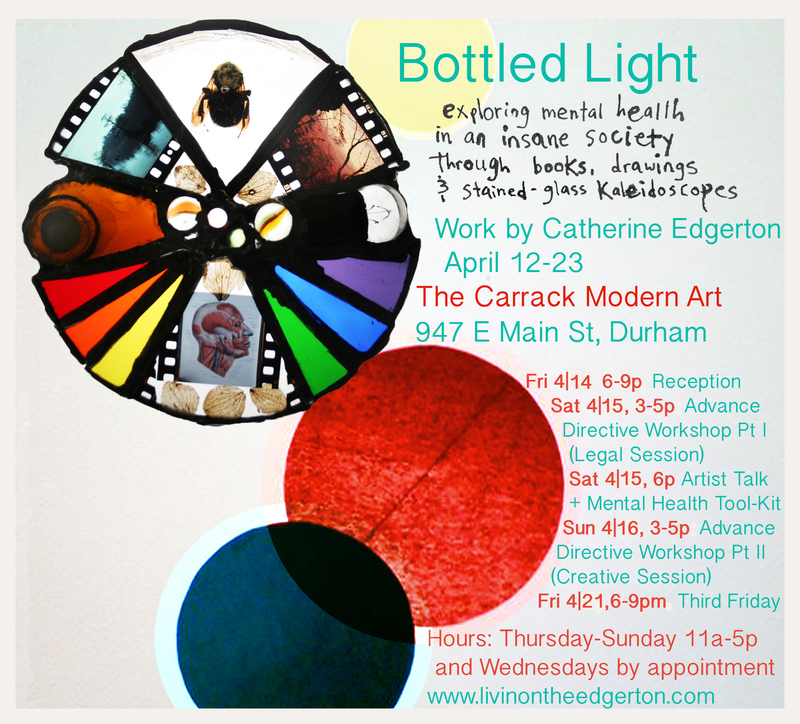 In tandem with this exhibit, Catherine has worked with the Art Asylum (a project of the Durham Artists Movement) to build tool-kits, crisis prevention / intervention strategies, and concrete resources to resist stigma, undermine criminal / patient labels, and foster creativity and connectivity between and beyond its members. The Art Asylum’s work, which is also on interactive display, broadens the lens to show how institutionalization and incarceration are tools for systematic oppression, as well as to demonstrate ways that understanding and art can bridge divides and reduce isolation.